The Indian Federation of Shotokan Karate (IFSK), an affiliated body of SKDUN and FBSKU (England) organised a Workshop on standardizing kihon, kata and kumite for IFSK Members on the lines of JKA Karate -do as propagated by the Late Nakayama Sensei. More than 70 brown & black belt students and 15 Black Belt Instructors of IFSK partcipated under the guidance of Sensei Somnath Palchowdhury, 5th Dan (FBSKUI, WKF, AIKF, SKDUN) a Shotokan karate veteran instructor of India. Kata Heian 1-5, Tekki Shodan, Bassai Dai & Gankaku were practised, analysed and Enbu was also taught. The objective is to attain uniformity and convergence of technical training in all IFSK Dojos. IFSK has more than 20 Dojos with more than 700 students in West Bengal and Eastern India. It is recognised by AIKF and is a main-line Shotokan organisation. Sensei Palchowdhury started karate-do in 1983 and has trained under Sensei Nishiyama, Kase, Shirai, Kawasoe, Naito, Kanazawa and other great Masters. He is a 'core' traditionalist' and believes in 'ikken hissatsu', the JKA way of Karate-do. He also drills in Shobu Ippon as his favourite. Sensei Arijit Chakraborty, 4th Dan, National Special Correspondent – WMA, was also invited to attend the camp. IFSK plans to organize 4 seminars per year on various technical aspects, other than normal camps / championships and grading sessions. Sensei Srish De, 5th Dan assisted Sensei Palchowdhury and the day long camp held at Durgabari, Ballygunge, Kolkata ,was a resounding success as students spent full Sunday working out heavily, braving the heat and wiping off the sweat through relentless training! Karate is of the sports that we all aware of. In the article the people of the India are shown. 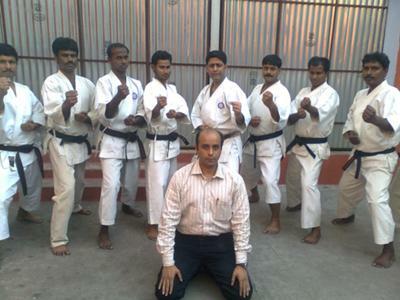 The people of the Kolkata are admired in the article for having the skills of the Karate. They all are the black belt students.